Done during the last 24 hours in the city in two road accidents, including a nine-year-old child died three others. 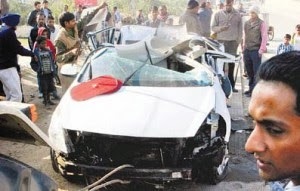 Zirakpur-Panchkula road the highest road accident Panchkula resident in the deaths of two friends. Relatives of the deceased out of the car after the accident, baggage is charged with theft. According to information received Zirakpur-Panchkula road Manoj Malik (36), a resident house number 123, Sector 12-A, Panchkula his friend Himanshu Tyagi (39), a resident of Rewari i20 car was coming from Panchkula Zirakpur. Meanwhile, when he came to Palmdale his car up on divaidara control. Meanwhile, the car turn around a 20-foot jump on. Capital police at the scene after the accident, trapped in the car to remove the injured had to heavy labor.